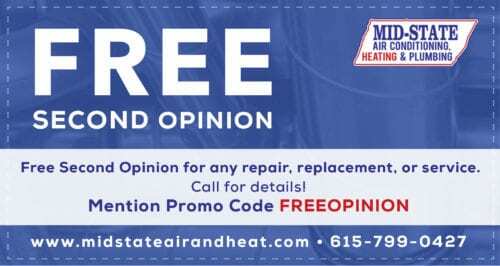 If you live in the greater Nashville, TN area and have an air conditioning system that is overdue for repair or maintenance services, now is the time to call the experts at Mid–State Air Conditioning, Heating & Plumbing. We will work with you to provide expert annual preventive maintenance services for your entire air conditioning system and be there for you if a problem should ever develop. There are many signs that your air conditioning system may need to be repaired. The first you’re likely to notice is that your air conditioner is no longer producing as much cool air as it once did. 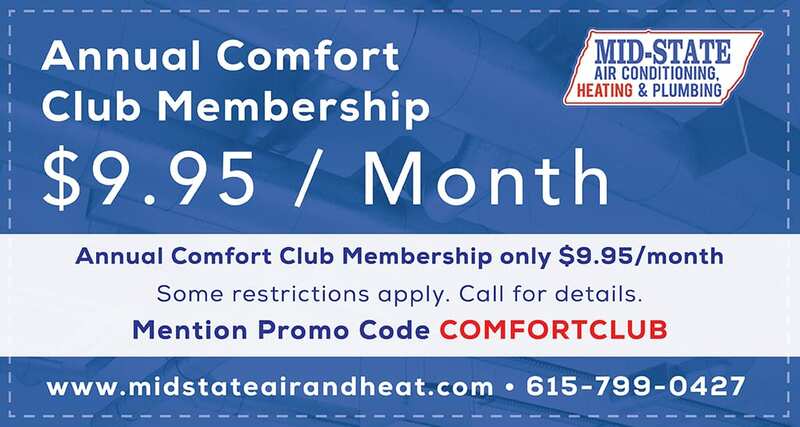 A sudden drop in capacity or an inability to keep any one room cool on the hottest days of the summer in Middle Tennessee is a sure sign that there is a problem. Usually accompanying such a problem is a sudden increase in the cost of operating your system. Higher operating costs are usually a sign that your air conditioner isn’t as efficient as it used to be or that it is compensating for a larger problem somewhere in the system. Other issues you might face that are sure signs that you need repairs performed in your air conditioning system include loud noises coming from the air conditioner or ventilation system, frozen coils, inaccurate thermostat readings, or uneven cooling between rooms. If you experience any of these symptoms, call us right away to inspect your air conditioner and ensure it is working properly. The most effective way to ensure such problems do not occur in your air conditioning system is to have regular maintenance performed on an annual basis. Annual maintenance should be performed each spring before you turn your air conditioner on for the first time. 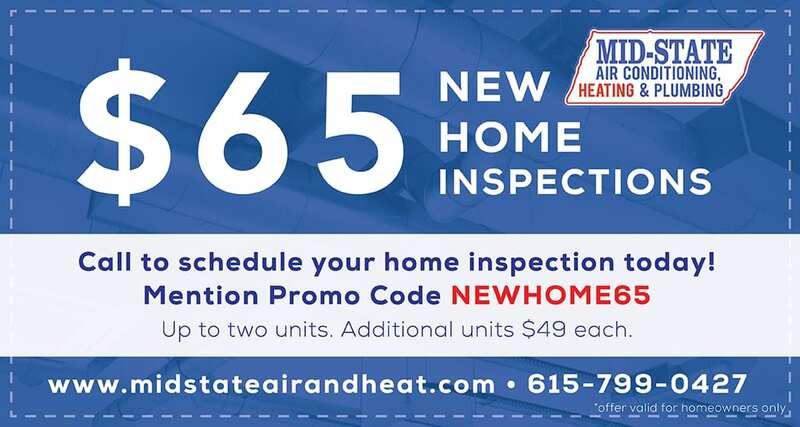 By having this maintenance performed, you will ensure your Nashville air conditioner continues to work at peak efficiency throughout the summer. During these tune ups, one of our technicians will inspect every component of your air conditioning system, including the indoor coils, the outdoor condenser, the air handler, your ductwork, and the thermostats. Electrical equipment, fan motors, and any other moving parts are all inspected, lubricated, and repaired if necessary. By having this done each year, you greatly reduce the risk of breakdowns occurring when you need your system to work the most. 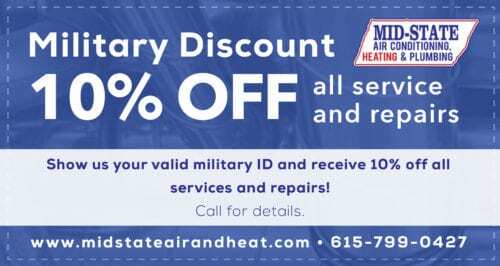 Whether you have a system that is only 5 years old and could use a tune up, or your Nashville, TN air conditioner is more than 10 years old and could use some repairs, call the experts at Mid–State Air Conditioning, Heating & Plumbing today to learn more about all of our services and how they can benefit you and your family today.